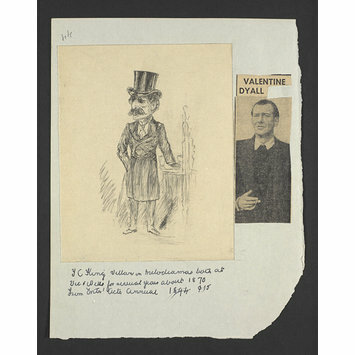 Full length pencil sketch of the actor Thomas Charles King (1818-1893), drawn by Alfred Bryan (1852-1899), ca.1894. This sketch originally appeared in an addition of the Entr'acte for 1894. The actor Thomas Charles King (also known as T.C.King) made his stage debut at the age of 15. Over the course of a long and successful career, King became particularly known for his skill at performing tragic roles. This career was commemorated in the obituaries published in periodicals such as The Era on the event of King's death in 1893. Full length pencil sketch of the actor Thomas Charles King (1818-1893). The image shows the actor dressed in a formal suit and top hat, his left hand resting on a small table to his left. The sketch is not signed but is very likely to have been drawn by Alfred Bryan (1852-1899) in ca.1894. 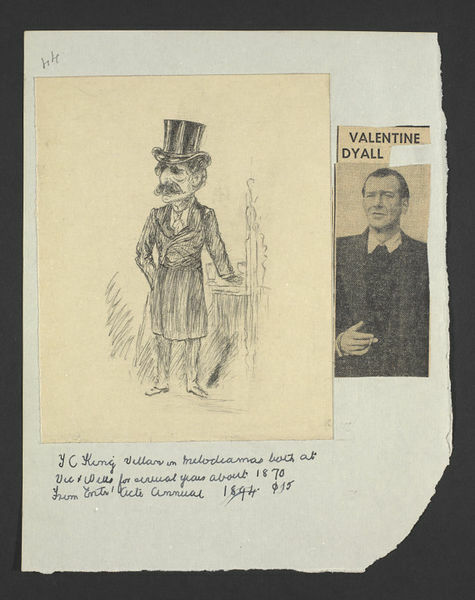 A press cutting showing a photograph of the actor Valentine Dyall (1908-1985) has also been glued to the cream paper backing and is positioned to the right of the pencil sketch of King.